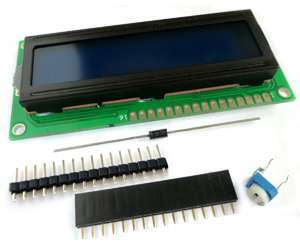 Also good for electronic experiments and projects. In Stock. Buy now from Amazon.com! 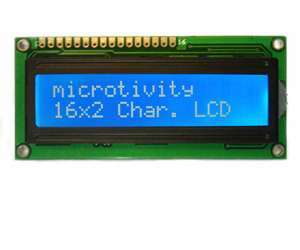 This 16x2 LCD module is based on the commonly-used HD44780 controller. It's easy to connect and program. One 16-pin female header, one 16-pin male-male header, a diode and a variable resistor is provided to help you make connections. Technical details: 2 rows, 16 characters each. Supply voltage: 5 volts. Color: White on Blue with backlight.